Could this be the end of free online Scrabble? Will Scrabulous continue to be free, or will the temptation to cash-in on its current popularity proove too great? According to an article in the New York Times, RealNetworks could be ready to make a bid for the under-fire yet hugely popular Facebook application, Scrabulous. Harold Zeitz, senior vice president for games at RealNetworks, is reported to have said that he was “working closely with the Agarwalla brothers to bring the official Scrabble game to Facebook users”. At present, the Indian brothers behind Scrabulous, Rajat and Jayant Agarwalla, are being threatened with litigation by Hasbro and Mattel. They own joint rights to the game in North America and the rest of the world respectively. Hasbro and Mattel claim, not without justification, that the brothers are guilty of intellectual property theft. However, the two companies are also reported to be looking for a solution that could allow Scrabulous to continue in some capacity. Step forward RealNetworks, which claims to hold a licence with both Hasbro and Mattel allowing it to publish an online version of Scrabble. Om Malik from tech blog GigaOM contacted RealNetworks for clarification. He received a reply from Bill Hankes, vice president of corporate communications, which read: “We aren’t saying anything that specific, except that we’re big fans of Scrabulous and think because of our licenses from both Hasbro and Mattel that we’re in a good position to work with them to keep the Scrabble experience on Facebook”. Although this all sounds promising for Scrabulous fans, there is a potential spanner in the works, which is that Electronic Arts also holds online publishing rights. According to Hasbro, EA is set to launch an online version of game in the spring. Whether this will be a free, ad-supported version remains to be seen. RealNetworks, meanwhile, already charges for a ‘GamePass’ to its RealArcade gaming site where its officially-licensed Scrabble game is hosted. In fact, to date only the Agarwalla brothers have proven themselves content to make money on the back of ad revenue alone. There are no such guarantees with Hasbro, Mattel, RealNetworks or EA. With Scrabulous currently flavour of the month attracting up to 700,000 daily users, the lure to cash-in with a pay-per-play or annual sign-up fee must be sorely tempting. However, any move to introduce fees would almost certainly prove counterproductive. 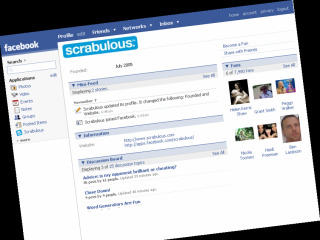 Scrabulous’ success on Facebook is primarily down to two things: it’s free to play and can be played directly in a web browser. Should either of these factors be compromised, then its popularity would surely nosedive. And, of course, no doubt it won’t take long before an alternative free version of the game takes the web by storm, putting Hasbro and Mattel and any online partner such as EA straight back to square one.